Defense Secretary Chuck Hagel Thursday approved a plan that would allow all military academy college sports, including high profile football games, to continue until the end of October, even as a partial government shutdown continues, according to a Defense Department official directly familiar with the plan. The official tells CNN that all of the sports programs have been able to ensure they will pay their expenses with funds not appropriated by Congress, such as ticket and merchandise sales. 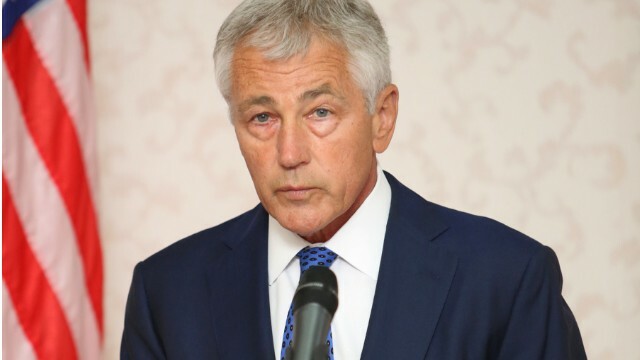 "The concept of the student athlete is important," said the official, adding that Hagel made the decision after consulting with the service secretaries. He said one factor playing into the decision is that if the Defense Department had halted sporting activities, such as the academy football games, it might have been in violation of broadcast contracts it has signed, and could have faced fines. Anyone else noticed the only thing unaffected by gov shutdown is gov? The only people who pay no consequence for it are the ones who caused it. The only ones not effected by it are the government that caused it. This is all bass ackwards . Not only are those kids serving their Country their parents have sacrificed their children to their Country @ everyones exspense. YOU MEAN TO SAY: SOCCER IS A COMMUNIST SPORT. He said: Ground based acquisition sports are in fact a cryptofacist metaphor to thermonuclear war. Hey, it works for me. Ground based acquisition sports are in fact a cryptofacist metaphor to thermonuclear war. Where else do you learn to advance your team to your opponent's territory, take what is yours, terrorize your opponent, send spies to see how they do war, watch films of them in action, steal their resources, and pillage their women after the victory if you can get them from grazing on the real turf field. I am glad the games game will go on... But just a few days ago Mr Hagel was talking to a none profit when he knew the house was voting on a bill to fund our fallen heroes... We all knew that it would pass in the house that is just a fact.. But the leader of our heroes Mr Hagel was not at Mr Reid office asking Mr Reid for a fast/asap vote on this issue.. And with that we must ask why Mr Reid did not bring this to a vote.. It took a GOP senior to ask for a vote.. It's a dam game to them and you Mr Hagel Mr Ried should be ashamed !!!!!!!!!!!!!!!!!!!!!!!!!!!!!!!!!!!!!!! The Obama Administration let illegal immigrants hold a rally in the National Mall they they closed, so why not let the football teams play. Just reported from the pentagon that the sports programs at the academies don`t require govt. funding to operate. So their is no reason to shut them down. The country is broke but Israel will still get its welfare. What a revolting situation. Why not just go ahead an fund the rest of the season instead of little by little. Sports and entertainment have positive roles in our daily lives. The govt. needs to consider this. O ya, all those Neanderthals who think the government should stay out of EVERYTHING (and, preferably, be closed) should be utterly happy to see it in "[s]ports and entertainment". What a waste of resources. The "big strong men" have to keep playing their kiddies' games, despite no money for anything else. What better way to show total immaturity? The games make the university around 4,000,000 per game. This is the only intelligent thing this white house has done in a long time. Nope. I won't accept it as "intelligent", nor will I agree with your stupid statement on the White House. So you want to punish college students when they have a option? Is there some reason you can thoroughly explain to me why they SHOULDN'T be "punished" at least as much as the rest of us? Besides, they're not just "college students". They're (ordinarily) government-subsidized semi-professionals, and the government is shut down. Phew, I was worried about that. Unlike all the other actually important things the Federal government does. Because they are self-stationing first of all. Second they are not regular college they are academies you don't get to go just because you can get a student loan. Third their season is pre-planned and pre-paid (travel/rooms) it would be a waste to appease a retard that just wants everyone to suffer. It's not immaturity. It's called "supporting their families and doing what they love the most"!!!! I think this is going to give the teams good publicity because it is showing that they are not going to back out just because the Government has hit a rough spot for the first time in 17 years!! You obviously have no idea of what a Service Academy is, how they operate, why cadets/midshipmen choose to attend versus a civilian college. These are not colleges: cadets/midshipment report the summer before their freshmen year and go through 6 weeks of intensity the likes of which you've never seen nor experienced. An exceedingly small percentage go on to professional sports after graduation and even those must receive the SecDef's waiver of military service. Because, you see, that's the crux, the major difference. After graduation, these kids enter the military for upwards of 6 years ... they're SERVING THEIR COUNTRY which may be something you're completely unfamiliar with.